Levi Strauss & Co. isn’t alone in its bold stance against inadequate gun control in the US. 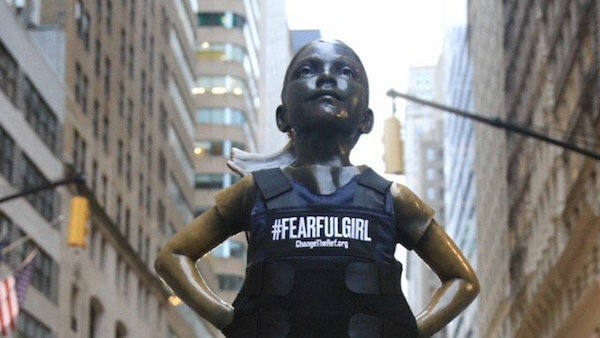 On 2 November, Manuel Oliver placed a bulletproof vest on ‘Fearless Girl’—the bronze statue by Kristen Visbal that stares down Wall Street’s iconic ‘Charging Bull’ to combat gender inequality—temporarily changing it to ‘Fearful Girl’. Oliver is the father of Joaquin “Guac” Oliver, one of the 17 victims killed during a shooting at Marjory Stoneman Douglas High School on 14 February. The loss of his son spurred Oliver to establish Change the Ref, an organization that uses urban art to tackle the lacking gun control laws in the US. The bulletproof vest was designed with the words, “Let’s bulletproof the future of our kids,” and the hashtag ‘#FearfulGirl’. Change the Ref hopes that the initiative will help spotlight the dire need for better gun laws prior to the midterm elections in New York City. Oliver told Newsweek that the vest remained on ‘Fearless Girl’ for about an hour before police arrived and the apparel had to be removed. The stunt was created in partnership with Fight Gunfire With Fire, a group that encourages students to utilize creativity to stand against gun violence in the US. Change the Ref credits three advertising students from the University of Alabama—MK Holladay, Emeline Earman and Mingyu Jo—for the original idea that eventually grew into ‘Fearful Girl’, shown below.